Understanding the requirements of the customers, we are engaged in manufacturing, supplying and exporting Agro Shade Net. All these nets are developed in tandem with the guidelines of the industry by using high quality material and employing latest machines. In addition to this, all these nets are supervised by our experts at every stage of production, in order to develop premium quality nets and eliminate defects, if any. 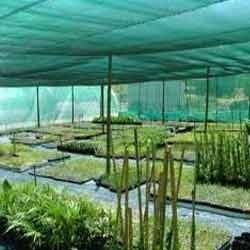 We also manufacture these agro shade nets in customized range as per the specifications laid by the clients. We are widely appreciated for offering the best Agriculture Shading Net. These nets are precisely manufactured by making use of optimum-grade high quality polymer, high density polyethylene (HDPE Plastic), procured from the accredited vendors of the industry. Furthermore, these nets are UV stabilized, thus protect plants that are kept inside the shade from bad weather conditions and UV rays. Keeping in mind multifarious demands of the clients, we offer these nets in different sizes and colors.